1) On what piece of scuba gear did Marlin find the address that Nemo had been abducted to, in "Finding Nemo"? 7) Super toughie: What chemical was Hooper (Richard Dreyfuss) planning to inject into "Jaws" through the shark-cage near the end of the 1975 Spielberg classic? 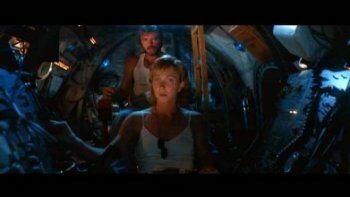 2) In what movie did we see this tank-top wearing blonde pilot an underwater vehicle? 8) What flick is this picture of two young submarine drivers from? 3) What effect did the underwater alien cocoons have on the old folks in the Ron Howard flick "Cocoon"? 9) In which movie did we see a soccer player, surrounded by scuba-wearing lab techinicians, training underwater? 4) What was the nickname for the silent propulsion system on the Red October in "The Hunt For Red October"? 10) In which 007 flick did James' car also double as a submarine? 5) What was the name of the unmanned submersible that evil Michael Biehn had carry a nuclear weapon to the inhabitants at the bottom of "The Abyss" in the 1989 flick? 11) What was the name of the submarine that Captain Nemo piloted in "20,000 Leagues Under the Sea"? 6) How many scuba tanks did "The Transporter" have hidden in the ocean beneath his lovely French home, in the 2002 action flick? 12) Speaking of Captain Nemo, what 2003 flick features the character of the good Captain?